A main street in Zurich. This is how our main streets should look in Santa Clara (Google Maps). Santa Clara’s traffic engineering department issued its latest bicycle master plan and it’s more of the same. We need to shake up the system, if we’re going to fix our transportation problems. Instead of a bicycle plan, we need a Public Transportation Plan, and the bicycle plan would be a subset of the transportation plan. I couldn’t find a transportation plan, but there is a General Plan. “The Bicycle Master Plan  is professional in all respects. In general, I agree with all its recommendations, if we are to follow down the current path, the status quo if you will. What will that get us in five years? 3 percent ridership? Maybe even 5 percent, according to the bicycle plan. “We have another choice. Spend our scarce dollars on programs that will incentivize the public to ride bikes. Take $10 million and use it to subsidize bicycle commuting. Money talks. There’s no greater incentive to getting someone to change a habit than a meaningful financial incentive. With today’s GPS systems, mileage can be measured and monitored. The system can be cheated, of course, but most people are honest. “If asked, residents will tell you that riding a bike is onerous during commute hours. It’s not pleasurable in most instances for most people. They’re not going to start riding a bike to work or to the store because it’s the “right thing to do,” or “it’s good for the environment,” especially when it will get them to work 15 minutes slower, sweaty, and inconvenienced in so many ways I can’t list them all here. “That 2 percent figure cited in the report for bicycle commuting is exclusively those individuals who love cycling. They’re crazy in love with bike riding. The rest of the public is not in love with cycling, never will be, no matter how many bike lanes we have. Electric bikes will help though. “However, they might ride a bike, if it can put a dent in their commuting expenses. While it’s true we gain benefits by leaving our cars at home, it’s not tangible. If they see a check in the mail for their riding to work, that will be a little more persuasive. Current dedicated bike commuters would be encouraged to give up their earnings to help fund new bike commuters, or “pay it forward.” These benefits would tend to help lower income individuals who commute to work by bicycle because they can’t afford a car. “Now, this ride-for-dollars incentive is only half the battle. The other half is to build cycle/pedestrian paths. Bike lanes don’t cut it. Take the rest of our money and build a bike network like San Tomas Aquino Creek Path, only wider. Ideally, we need two north-south and two east-west corridors dedicated exclusively to bicycle/pedestrian traffic. It can be done. We just need to think differently. “Commuting is a hassle, whether by car, train, bus, or bicycle, but it’s a necessary evil. Nobody wants to give up his car, but the way things are going, it looks like that’s our future as traffic worsens. Bicycles can play a significant role, but only if we do something radically different. Staying with the status quo won’t cut it. The city’s bike plan could just as well be the city golf course plan. Solving our transportation problems can’t be resolved by increasing bicycle usage a few percentage points. Light rail would be huge. We used to have light rail throughout Santa Clara Valley. Light rail ties visible on The Alameda at Camino Drive during road realignment for Santa Clara University in 1984. Who’s going to pay for it? We are. All we do is shift our priorities and put most of our transportation dollars into light rail. The Green New Deal will help us prioritize. What’s crazy about shifting from fossil fuels to renewable energy? Easy oil won’t be around forever. Finally, it’s true our transportation issues are regional and require cooperation among cities, counties, state, federal agencies. Let’s not forget that Santa Clara has its own fantastic utility. It’s part of a larger power grid. We helped pay for a massive stadium. I think we can do more with transportation. 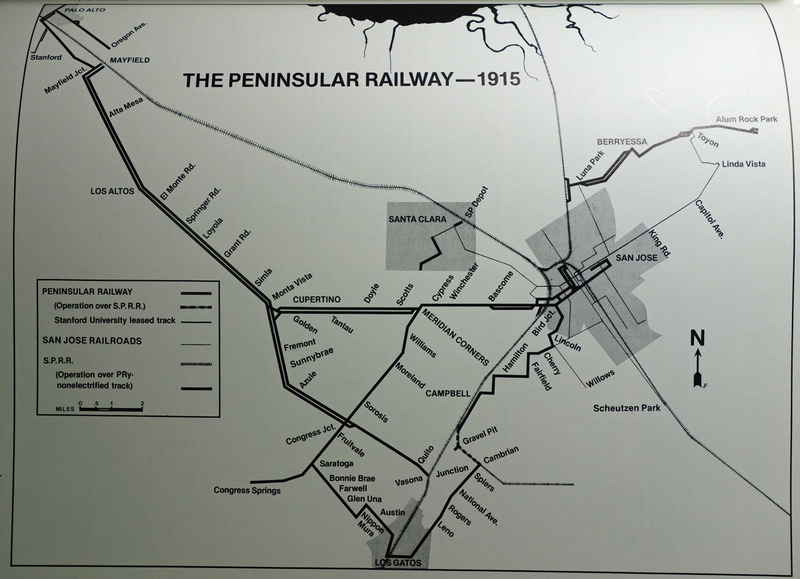 Peninsular Railway in 1915. From “Tracks, Tires & Wheels,” by Charles S. McCaleb. A bicycle rack exposed to the elements next to a $24 million parking garage. What gives? 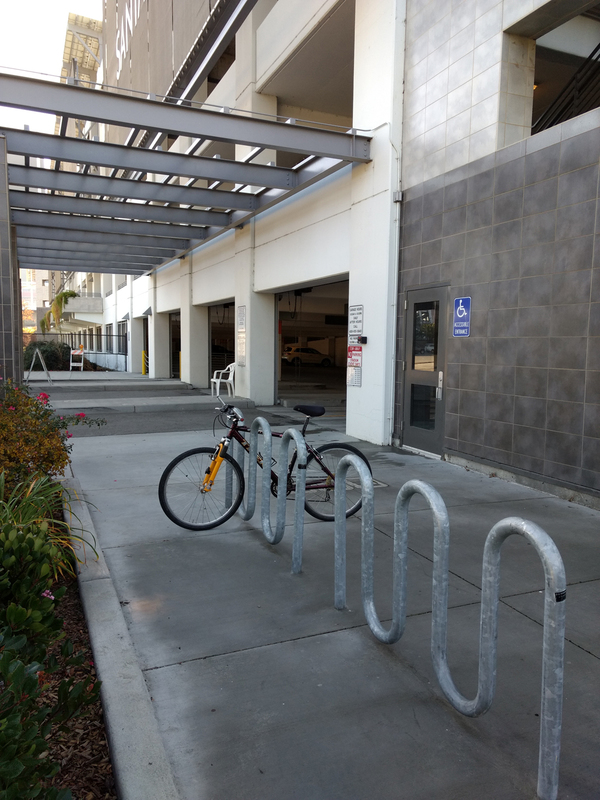 In case you didn’t know, Santa Clara spent $24 million on its six-level, 1,821-space garage off Tasman Drive, complete with charging stations, but the bicycle accommodations fall short. The wave style rack is exposed to the elements. Santa Clara can do better. If nothing else, put a roof over the racks. More could be done, of course. In a day and age when we desperately need commute alternatives, I can think of ways to put the garage to better use. Someone might want to drive to the garage (parking is free) and then ride from there to work on the bayland trails, avoiding traffic. They could keep their bike in a locker at the garage. About 20 lockers are located at the train station at Lafayette and Tasman, but it would be inconvenient since there’s limited parking close to the lockers. Tantau Avenue and Apple HQ looking north. Will employees ride bikes to work? While I don’t think road diets and protected bike lanes will make much of a dent in the way people get to work, those who do ride bikes today will not be complaining about changes coming down the road. Local residents (read Nextdoor) were up in arms about the road diet that went into effect on Hedding Street in November between Coleman Avenue and Winchester Boulevard in San Jose. Some people who contributed their thoughts favored the change, but most were against it. The main argument — and a valid one — is that too few cyclists take Hedding and the road change would have little effect. The transportation/housing problems we face today are systemic and a road diet for one street isn’t going to make much difference. However, it certainly does make the pedestrian’s walk and the cyclist’s ride safer. I noticed minor backups on Hedding eastbound, but it was hardly apocalyptic as characterized by some who posted comments. By 9 a.m. there was no traffic to speak of. Now Apple is pumping $1.8 million into Cupertino city coffers for protected bike lanes on Stevens Creek Boulevard. With their spaceship HQ about to open, they must be nervous about its affect on commuters. Over the years I’ve slowly changed my thinking about protected bike lanes and multi-use trails from neutral to all-in. It’s the best way to reduce the number one objection to bike commuting — dangerous in traffic. The plan is to head west from Tantau in phases. Details have yet to be worked out. I’ve long advocated greater commitment by corporations for supporting non-auto commuting. They should flat out pay employees to ride to work, as well as cover bus and train expenses. The use of corporate buses is a step in the right direction. As far as systemic changes, we need to see more people living close to work. City governments are doing their part now by requiring sufficient housing near business parks. Our sacred American way of life– single-family homes — is a big part of the problem. European and Asian communities don’t have them. Concentrating populations makes commuting by bike and public transit less of a burden without urban sprawl. In the meantime, our governments are doing their best with what they have to work with. They look to the bicycle. It’s a fantastic machine, no doubt, but making it the commuter silver bullet is asking a lot. 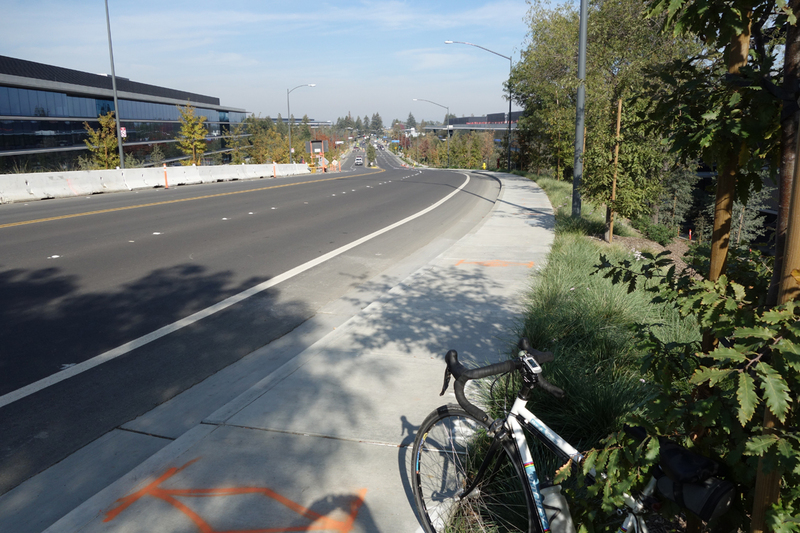 Looking north, new ramp off San Tomas Aquino Creek trail makes for easy access to nearby stores. 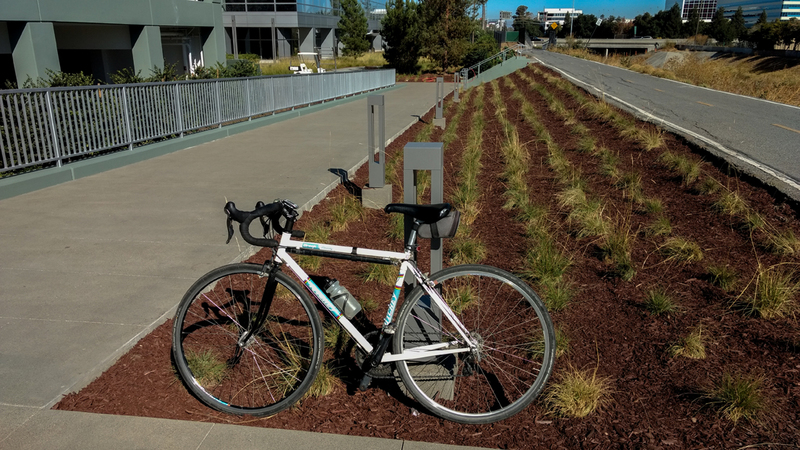 A new office building/parking garage bordering San Tomas Aquino recreation trail near Hwy 101 was designed with the handicapped, pedestrians and cyclists in mind. Bravo. The ramp and short staircase connects the trail to Augustine Drive in Santa Clara. So what? It’s a way for someone wanting to avoid taking busy city streets to access the Whole Foods Market, the new AMD buildings, new apartments and other stores at Scott Boulevard and Bowers Avenue. That’s a big deal in the scheme of things. It must have cost at least $25,000, but money well spent. Bike stacking proposals for the new Caltrain cars. Which do you prefer? Vote now. 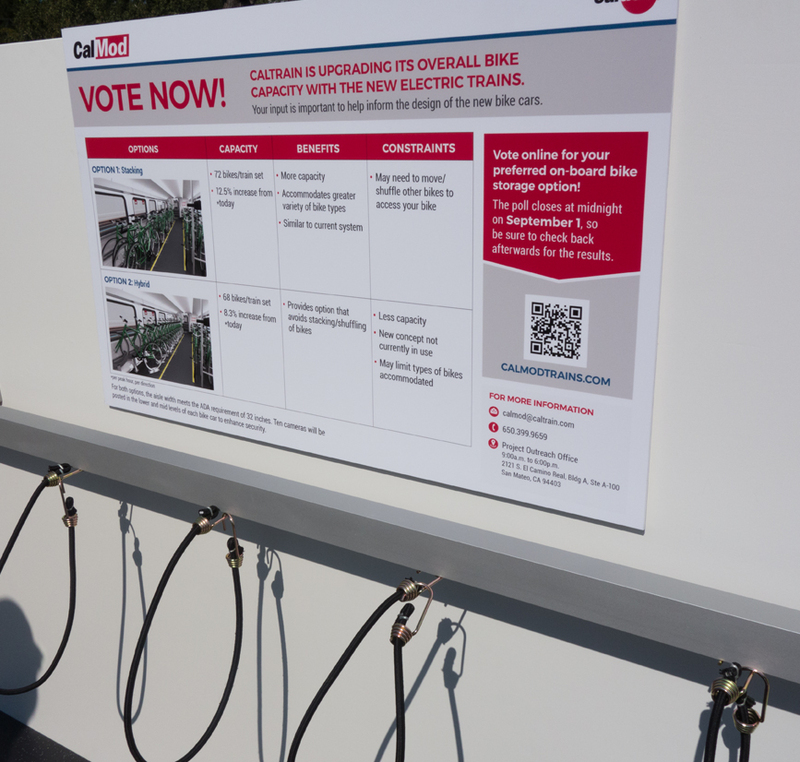 Caltrain is soliciting your comments on how bikes should be stacked on its new cars, which will be part of the electrification plan. I prefer the traditional stacking method. Over the years I’ve never had an issue. Most cyclists tag their bikes, which says where they’re off-boarding, so it’s easy enough to find the right place to place your bike. The disadvantage of the alternate single-bike stack is that it reduces the number of bikes that can be carried. I anticipate we will have an increasing number of riders on Caltrain in the coming years, and I’d like to see as many people as possible riding bikes. Here’s a link to where you can vote. The presentation was made during the Silicon Valley Bike Summit, held Aug. 8 in Mountain View on the Microsoft campus. El Monte Road path under I280. Cyclists are expected to use this path, or didn’t you know that? 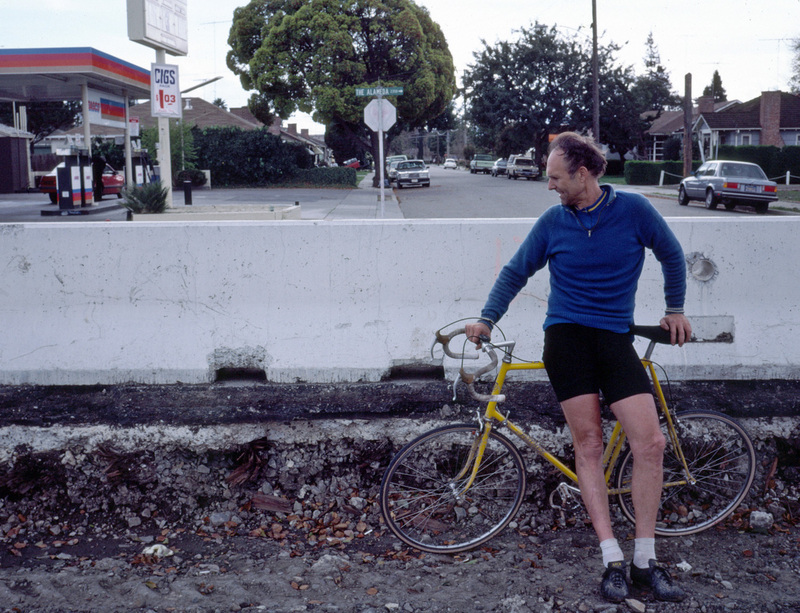 I’ve been riding on El Monte Road into Los Altos Hills since 1980 and in that time I have not seen one finger lifted to make it safer for cycling. Or so I thought. You see, I always assumed the improvement would come with bike lane striping as the road heads through the classic cloverleaf intersection at Interstate 280. There’s a lot of traffic on a weekday at hours when a student cyclist attending class would be expected to ride here. However, I NEVER see cyclists riding on El Monte Road at these times. For good reason. Drivers blast through this intersection, always in a hurry to get onto the freeway for a meeting, to which they’re already late. After seeing some cyclists stop at a crosswalk prior to the freeway, walk across, and then ride under the freeway on a paved path, it occurred to me this is what the state of California and Los Altos Hills expect us to do. So I tried it out, several times. I can’t say it’s terrible, just bad. For starters, I would never use the crosswalk to get to the path. That’s silly. I’m a cyclist, not a pedestrian. Check the video below to see how I handled it. I’m not going to completely dismiss the intended route, because it does work after a fashion, but anyone new to the area riding west on El Monte would have no clue that the path existed, nor would they have any idea where it went even if they got on it for the first time. The issue I have with the route is that anyone riding on the path has to be especially alert at the left turn for Stonebrook Drive and access to the path from El Monte calls for a complete stop before crossing, assuming you can’t see what’s coming. I’m not crazy about this stretch of El Monte, even with the path, which is why I always take Stonebrook Drive through Los Altos Hills over to Magdalena Avenue. I think the I280 – Magdalena intersection is far safer. Of course, that route does nothing for a student trying to get to class, but then nobody rides a bike to Foothill College, and I can hardly blame them, considering how the death-defying El Monte Road freeway interchange stands in the way. Every little bit helps, including making traffic signals “bicycle friendly” as was done recently at Mary Avenue and The Dalles Avenue in Sunnyvale, after I made inquiries. Sunnyvale public works, Sunnyvale Bicycle and Pedestrian Advisory Commission (SBPAC), as well as John Cordes, SBPAC member, paid attention to my request and now the Mary intersection signal turns red for bikes on Dalles after a brief wait of about four seconds. I registered my concern when the light did not turn for long periods, or not at all. A local cyclist I spoke with at the intersection said she had the same issue. I can’t say for sure it will always change in that time, but it has behaved that way for me on a couple of occasions, weekdays non-rush-hour. San Jose fills dangerous potholes: And not to forget San Jose, they quickly filled in some seriously deep potholes on McKean Road near the Cinnabar Hills Golf Club after I reported it. The holes presented a severe hazard for cyclists speeding down McKean. Thanks! Since we’re in the mood for blowing away the entrenched establishment, it’s time we remapped the valley’s transportation network — more light rail and fewer cars. I’ve been seeing what’s coming down the pike — the urban village — which is another word for Europeanization. I’m all for it. It’s happening in your back yard, along Winchester Boulevard, Stevens Creek Boulevard, Mountain View’s San Antonio area, Tasman Drive in Santa Clara, north First Street in San Jose. Denser housing is a way to maintain regional growth, but when it comes to finding ways for these new residents to get around, we bury our heads in the sand and rely on cars. This lack of transportation planning can’t continue on its present trajectory. All we have to do is adopt the model of cities like Zurich, which rely on light rail for short trips and regional trains between cities. There are still cars, just not so many. Bicycles play a bigger role, especially in the Netherlands where 31 percent of the populace count cycling as their main mode of transportation. I included a map of Silicon Valley where light rail could run, shown in red. We can start with major corridors like: Stevens Creek Boulevard, San Tomas Expressway, El Camino Real, Central Expressway, Lawrence Expressway, Sunnyvale-Saratoga Road, Homestead Road, Winchester Boulevard, etc. Many of these historical routes had light rail, back in the late 1800s. There’s plenty of room for a lane of car traffic (more one-way roads), maybe even two lanes, and bike lanes. We can keep the freeways as is. You might think that the autonomous car will solve all our traffic problems. Not so. Some experts predict there will be even more traffic. Robot cars will greatly reduce accidents, but they’re not the answer. Light rail is the ultimate solution. Autonomous vehicles will be useful for those with special needs and, of course, the uber wealthy. From attending recent community outreach programs with Caltrans and Valley Transportation Authority, I get the impression these government entities are stuck in the past. They need a wake-up call. Zurich transportation map. Rail line everywhere. The city of San Mateo has a bike share program. Bike share programs in the Bay Area continue to expand, with the city of San Mateo launching one of its own on May 12. Kathy Kleinbaum, senior management analyst, City of San Mateo, told an audience at the Silicon Valley Bike Summit back in August that they signed up 310 users in just three months. The system is different from others in the Bay Area in that users have much greater flexibility on where they can park their bikes. Most system require leaving bikes in a designated area at all times, but San Mateo lets users park their bikes at any city sidewalk bike rack, and leave them. How it works. Their system, along with a mobile app, was developed by Social Bicycles, based in New York City. The 50-bike pilot is scheduled to run for three years. “We’re not expecting to recover costs from fees,” Kleinbaum said. “We hope to have a corporate sponsor.” She mentioned that Nike sponsors a bike share program in Portland, Ore. The city has 11 bike hubs around the city, mostly at transportation centers and office parks. “Right now bike commuters and office workers are the target, but we plan to expand to residential areas,” Kleinbaum said. The cost is $5 per hour or $15 per month for an hour of use a day, cumulative. There’s an out of hub fee of $3, but a $3 credit if you take a bike from out of hub and bring it back. Bikes are restricted to the city of San Mateo. She said a Clipper card can work on their system, technically, but needs to be implemented. I’ve never used bike share, but I can envision situations where I’d want to. However, to be successful, the system needs to be as simple as possible. I’m talking really simple, like swiping a Clipper card or credit card and off you go. Better yet, populate downtown areas with free bikes and be done with it. 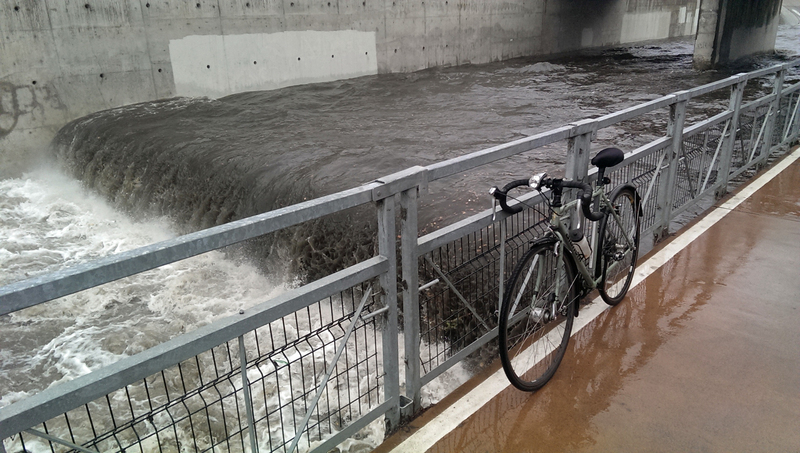 One of the joys of bike commuting, checking out the creek trails in the rain. Back to work at Kifer Road and Lawrence Expressway, I began commuting on San Tomas Expressway once more. After a year or so on San Tomas, I came to the conclusion that riding on the busy expressway no longer appealed to me, for two reasons: air pollution and noise. 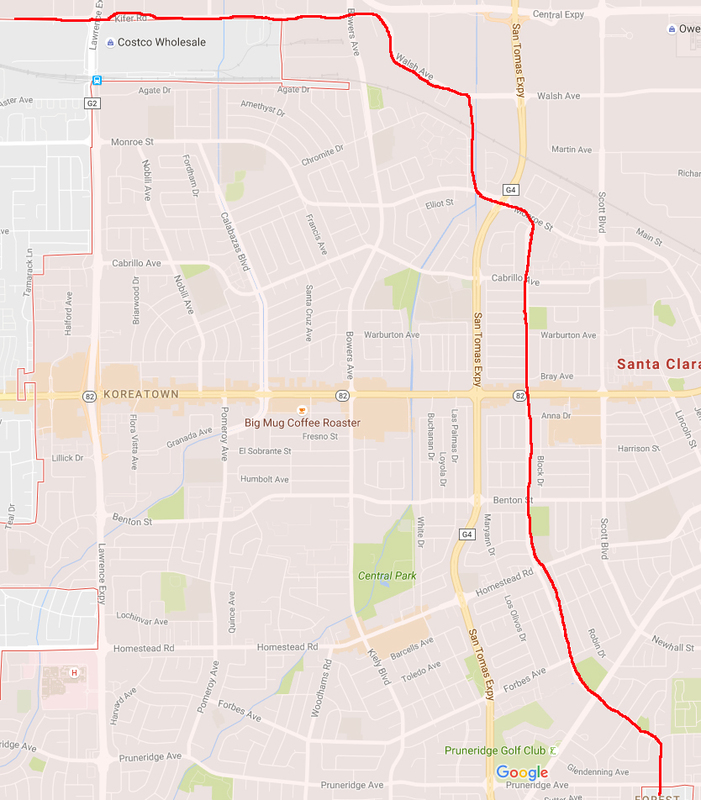 I had enough of both, so I started taking Los Padres Boulevard to Monroe Street, then the San Tomas Aquino Creek path, left onto Walsh/Kifer. Los Padres is my favorite street with a bike lane. It cuts through residential Santa Clara and has light traffic, speed limit 25 mph. Going home I took Central Expressway to the San Tomas bike path. I never liked the narrow section of Kifer/Walsh near Costco. It was always busy. I had easy access to Central from my work and I could fly. There’s a wide shoulder all the way. Even though the expressway is jammed during rush hour, it never slowed me down. With the daily bike commute behind me, I avoid all the heavily traveled streets whenever possible. After so many years riding in traffic, I’ve come to appreciate lightly traveled roads and all they offer. Los Padres Boulevard became a favorite route to work.